The Holidays are HERE! And we’ve decided to add our own Willy Wonka touch this yuletide season. A select few lucky customers will find their BUZZ COCOA Original Blend wrapped in gold packaging. 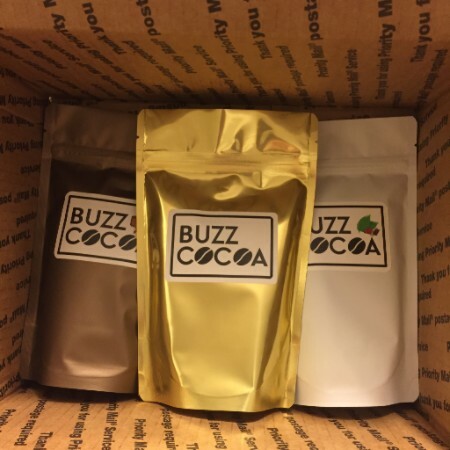 If YOU are one of the lucky few that receive one of our Golden BUZZ bags, consider yourself the WINNER of a FREE bag of BUZZ COCOA – your choice of any one of our delicious flavors. Just pay shipping & handling – it’s that easy. All we require is that if you have an account on Twitter, Facebook, or Instagram, take a pic of your lucky find & tag us in the post! Make sure you use the hashtag #GOLDENBUZZ and spread the word about the greatest caffeinated hot cocoa. I then thought, how much would people save by making the switch from Starbucks to BUZZ? So I took to the drawing board and then figured out that, given our product costs $15 a bag (approximately) divided by 20 servings, we offer a competitive $0.75 price per serving size. Now Starbucks, on the other hand, for a very typical beverage charges $4.15. Multiplying the price per serving size, we arrive at $83 for total cost. That’s insane. 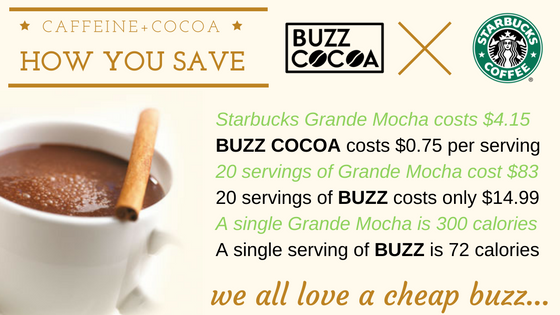 We at BUZZ COCOA think that you shouldn’t have to overpay for tasty caffeine. Instead, take a look around www.buzzcocoa.com and feel free to do your own cost comparison.